These days, apps play an integral part in everyone’s everyday lives. We all have smartphones at this point, and there are a variety of apps that can help to keep you in check, no matter what your needs. One of the best apps for everything related to cleaning your home or apartment is Handy. 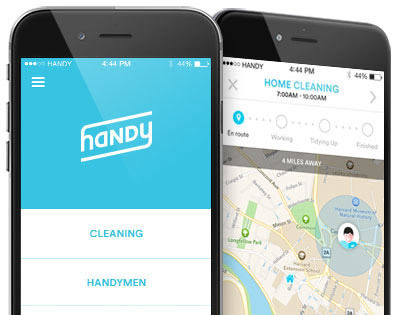 The Handy cleaning app was previously known as Handybook and was founded back in 2012 by co-founders Oisin Hanrahan and Umang Dua. It came to be when Hanrahan was a student in Ireland and became a real estate developer in the Eastern Europe area. He began to purchase and renovate apartments in Budapest and soon developed the idea of Handy as a means of helping people to acquire a variety of services for the home. Over the past few short years, Handy has gone from being a simple database of professional house cleaners, painters, plumbers, electricians and other home related professionals to a huge service that allows you to locate and book these pros. The service is available in the United States and throughout Europe. It has become so hugely popular that it could expand into other regions as well, including Asia and specifically, the southeastern country of the Philippines. Handy provides users with a one hundred percent money back guarantee if they are not satisfied with the services of a professional who performs work on their home. However, it should be noted that all professional home workers are thoroughly background checked, highly experienced, friendly and insured. When you use the Handy app, you can quickly and conveniently schedule the home cleaner, plumber, electrician, mover or other professional of your choice, in as little as 60 seconds, and schedule them to come to perform services as early as the next day. To use the app, all you need to do is to choose the payment method you want to use, select a professional and the date and time you want them to show up at your home. Because the app is right on your smartphone, it is highly convenient and you can book and manage your Handy appointments right at your fingertips while on the go at any time. Wow! Weight Loss Has Never Been This Easy!